Golfers from the 2016 outing await the shotgun start. To register for this year’s outing, call 740-335-0761. 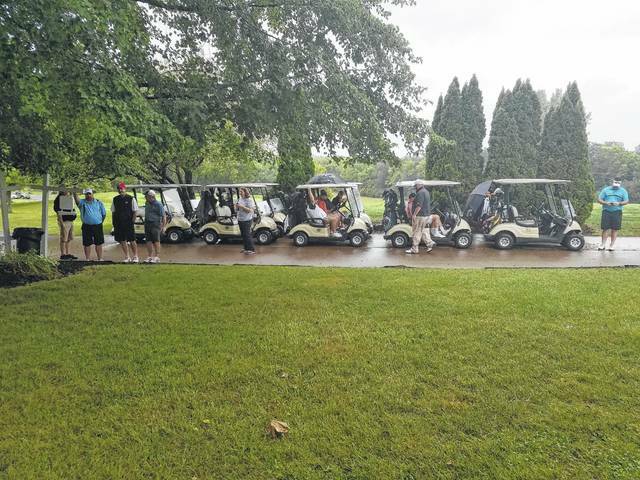 The Fayette County Chamber of Commerce still has spots open for teams at its annual Scholarship Golf Outing on Friday, Sept. 8 at Buckeye Hills Country Club. The annual event is a day of fun for anyone who would like to play, with proceeds being used to provide scholarships for local high school graduates. Golfers will participate in a scramble format. The day starts with an 11 a.m. lunch buffet, 12 p.m. golf ball drop and 12:15 shotgun start. Non-golfers and golfers alike can buy a numbered ball for the Golf Ball Drop. Balls are on sale now at the Chamber office for $5 each or six for $20. The numbered balls will be dropped from a bucket truck and the three balls to land closest to the pin will win cash prizes of $250, $150 and $50, respectively. “We are looking forward to this annual event. Everyone is invited to participate and help us as we raise scholarship monies for students from Miami Trace, Washington Court House and Fayette Christian Schools,” said Chamber President Whitney Gentry. Entry fee is $200 per team and can be made at the Chamber office, located at 206 E. Court Street, or by calling 740-335-0761. The fee includes lunch, golf and cart. https://www.recordherald.com/wp-content/uploads/sites/27/2017/08/web1_GOlf2-2016.jpgGolfers from the 2016 outing await the shotgun start. To register for this year’s outing, call 740-335-0761.